Currently viewing the category: "Craftsman"
If you own a Craftsman, Delta Shopmaster, DeVilbiss, Husky, or Porter-Cable air compressor, heads up: DeVilbiss (the actual manufacturer of these particular models) announced the recall of about 460,000 compressors due to an overheating problem that can pose a fire hazard. 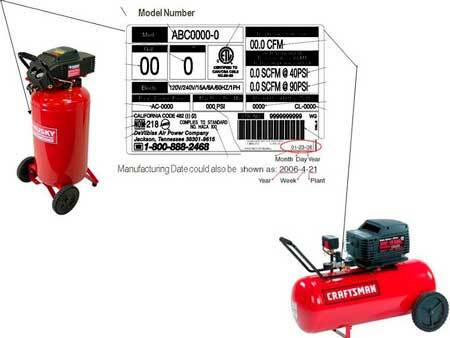 The picture above (courtesy of the CPSC) shows where to check model number information, but you’ll want to visit the CPSC website (link below) to check the extensive list of affected models, which we sold at “home centers nationwide from January 2003 through December 2004.” Affected Craftsman models were sold at Sears (of course) from September 2000 through December 2005. I came across a piece last week (via Lifehacker) on and it got me thinking: How many of you hard-core Toolmongers currently own older storage solutions — either restored or not? While I haven’t bothered to throw on new paint, my shop is full of a mix-match of various storage gear I bought and inherited. 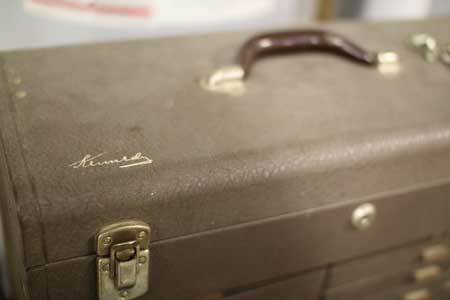 Pictured above, for example, is a Kennedy machinist’s toolbox that came out of my father’s shop. 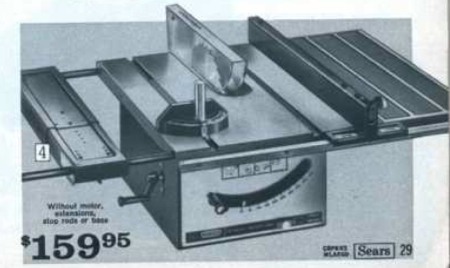 The “Heavy Duty ‘Driver’ Bench Saw” from a 1931 Sears/Craftsman catalog, only four years after Sears registered the brand, boasted that it came “complete with motor” and Timken tapered roller bearings. It cost $9.50 at the time (an average month’s rent on a house was $18), and was considered innovative for its speed and durability. What I find interesting is how little the basic technology of the table saw has changed in 80 years — or how advanced it was for its time. 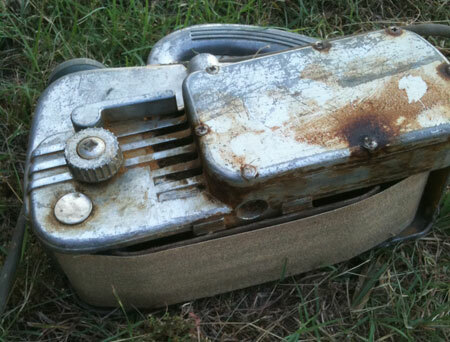 One other curiosity I found among the wreckage of my friend’s garage was this old Craftsman 18-inch belt sander. It’s in surprisingly good shape considering it’s older than I am. What I found to be an even bigger surprise was when I plugged it in, it fired right up. It’s seen better days — the cord would need to be replaced and it’s leaking oil from within, but all in all I’d say it’s a pretty good find. All the adjustments still work and it looks uber-sweet. It’s funny to see it doesn’t look all that different from the models of today really. One Man. One Mower. One Country. We receive a lot of press releases, and generally they feature one gimmick or another to try to attract our attention to the manufacturer’s latest offering. We usually skip over the gimmick, look at the tool, and either write about it — or don’t. 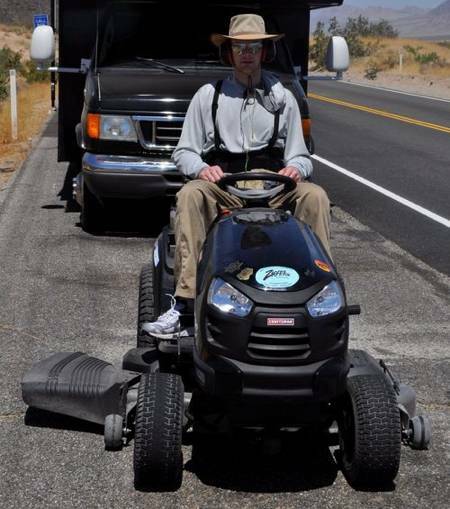 In our opinion, however, this gimmick earned at least a mention: A dude is currently making his way across the United States on a Craftsman lawnmower. And no, we’re not kidding. Think your yard is big? He’s driving 3,300 miles, stopping for promotions at various Sears stores. 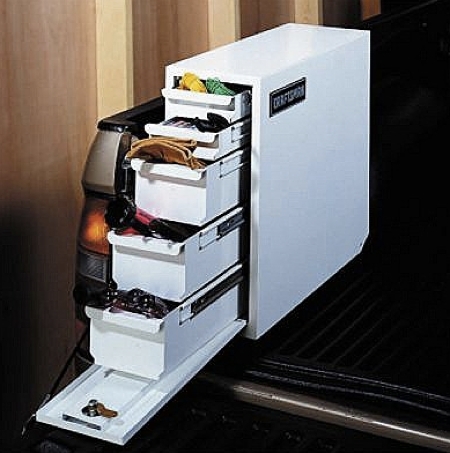 There’s nothing quite as handy as a truck box for storing that extra stuff you need to carry but don’t want stuffed into the already-tiny cab area. But sometimes the normal front-positioned box gets in the way of, say, a dirt-bike mount — or anything else long enough to require the entire bed length. But fear not: There are other options, like this wheel-well box from Craftsman. Craftsman club members usually get the best deals on Craftsman gear, and lawn care is no exception. 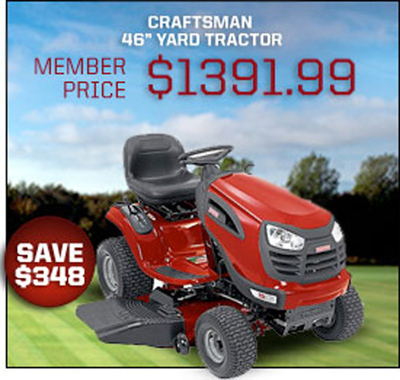 From now until April 24th, Craftsman club folks can knock a chunk off mowers like the 46” lawn tractor above, shedding about $350 off the regular price. Like you, we couldn’t help but get a little excited when we heard Ace Hardware’s announcement that they’ll carry Craftsman tools. 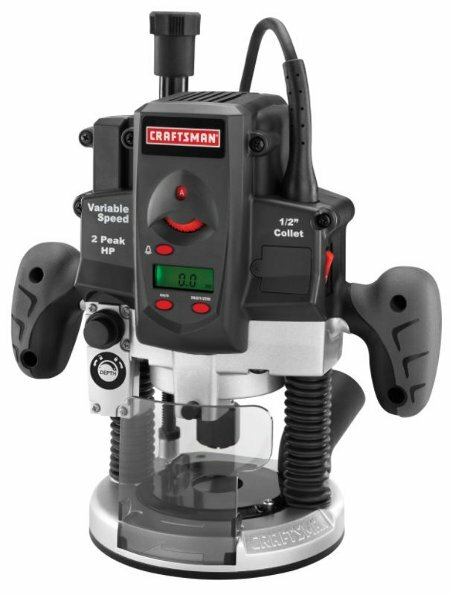 And it looks like that’ll happen as we’ve heard that Craftsman has indeed introduced Ace stores to their products. But we still have two big questions. 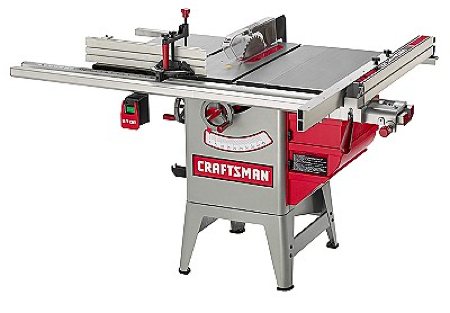 According to the folks at Craftsman, approximately 100 Ace stores will begin selling Craftsman tools this May. That includes portable power tools, compressors, wet/dry vacs, and storage products — but most importantly, it includes hand tools. 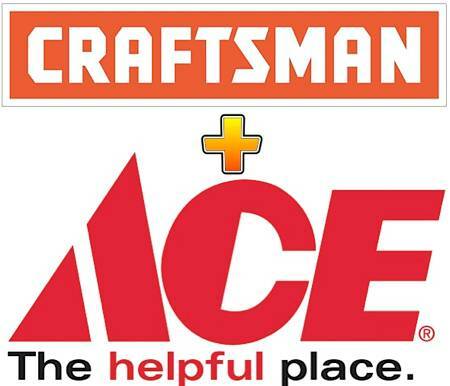 Later this summer Ace plans to extend the extend the offer to carry Craftsman products to all of its 4,500 stores.